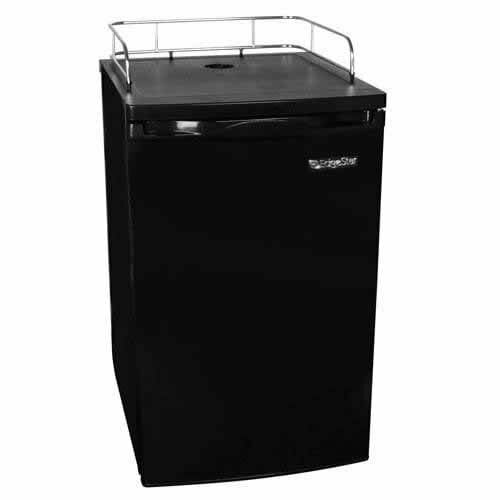 Best Mini Fridge for Kegerator Conversion Reviews: Top-5 in April 2019! For those of us that like our cold beer, the price of beer has its effect on our enjoyment. Consider that buying beer in kegs reduces the cost by 50%. Yup, 50% less for the same amount of beer when bought in a keg. So, why bother buying cans and bottles that take up more space, cost twice as much and are a litter nuisance. Invest in a keg of beer. OK, so now you just bought a keg of beer and realized that it’s not cold. What do you do? Well, there is a solution, and while it might sound expensive, it actually maintains that a 50% reduction in cost within the first month of use. Especially if you do like to drink beer every day, or if you invite friends and family around for weekend BBQs. Yes, you heard me right the first time, kegerate, this is the verb for converting a standard small fridge or freezer into a beer keg cooling unit. Essentially its quite simple, and for fridge’s you just make some adjustments, for freezers, you add a temperature control unit. These convert your fridge door into a dispensing unit, where the faucet is placed in the door and connects to the keg inside. This makes it easy to use the fridge of the keg and retain the storage facility of the fridge for other bottles and cans. These are less standard but available, these models require opening a hole in the top of the fridge, and a pipe leads the beer out to a “tower” faucet that is placed on a table top above the fridge. Essentially it’s like going to a bar. Kegerator conversion kits are now easy to find, and there are many options to choose from, so your issue is not the conversion kit but the fridge or freezer unit. You need to know which one to buy. When you kegerator a fridge or freezer you will need to maintain the internal temperature between 36°-38° F connecting the keg to the faucet and providing proper beer dispensing. This assures that the beer doesn’t warm up before you dispense it. The size of the fridge or freezer unit must be large enough to hold the keg. You will need to buy an aluminum 5lb CO2 cylinder to provide the pressure to push the beer from the keg to the faucet and out into the glass. Make sure the cylinder comes with all the self-sealing O-ring components and is ready to install without assembly or additional hardware. Make sure that the CO2 Cylinder is supported by a commercial grade CO2 regulator. You don’t want any type; you need either a bespoke non-adjustable pressure relief valve system, or a generic commercial adjustable unit that has a 55-65 PSIG blow off valve. The internal pressure needs to be kept below 15 PSIG, so you also need an internal bleed off valve to relieve the buildup of internal pressure. Brewery approved CO2 Pressure Line. Keg Coupler or Keg Tap; the keg requires you couple it to the CO2 cylinder using a special valve. Beer Faucet obviously you will need a faucet to flow the beer into the glasses. Beer Shank for the tower loading assemblies, you need a shank to connect from the keg to the tower faucet. Brewery approved Beer Line; this is the hose that connects the keg to the shank or to the faucet. OK, so now you know what is needed in a Kegerator kit, let’s look at the fridge and freezer units that are rated as the five best mini fridges for kegerator conversion. The EdgeStar Ultra Low Temp Refrigerator for Kegerator Conversion is the refrigerator used to build the EdgeStar kegerator. The EdgeStar Ultra Low Temp Refrigerator model BR2001BL is a refrigerator only but is designed specifically to convert with a complete conversion kit that delivers a large capacity unit for large kegs. This model comes with full adaptability to an EdgeStar kegerator conversion kit, so you don’t need to look around and find a kit. The fridges dimensions are Depth: 26.5” x Height: 35” x Width: 20”. This is an EdgeStar model that is designed specifically for Kegerating, you won’t go wrong with this one, and if you buy the EdgeStar kegerator conversion kit, you will have a perfect system up and running in no time. This is the Kenmore 99053; it’s a small unit with 4.5 cu. ft. volume capacity, so its good for smaller kegs, and is perfect for student dorms and compact locations. This 4.5 cu. 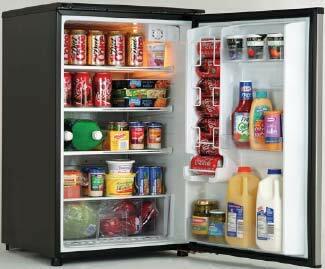 ft. capacity fridge unit comes with an easy to use a thermostat that lets you control the temperature easily. It has an added cooling compartment, although when kegerating you will most probably forgot this section in favor of the keg hardware. This model comes with a low noise compressor and functions at a very silent mode, so you don’t get disturbance. The design is a compact and simple finish that fits in any style of home, office or dorm. This is a nice small model fridge that provides compact kegeration and will surprise everyone when you have it installed and ready to run. 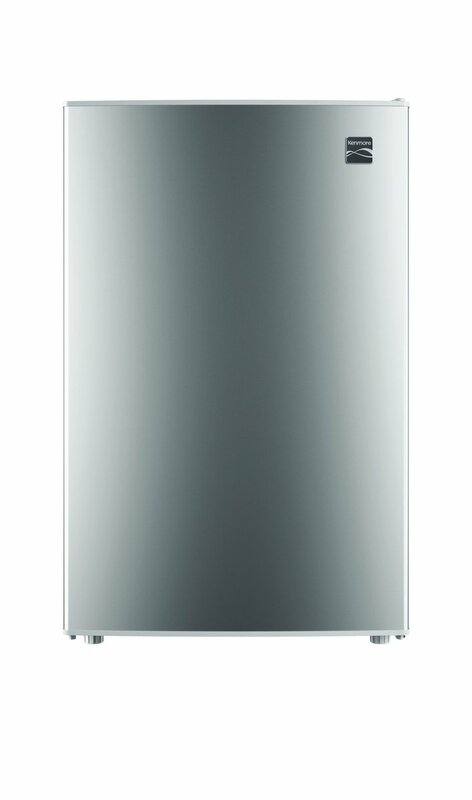 This is the Energy Star® rated Danby Designer® compact fridge with 4.4 cu. ft. (124 L) capacity. This model comes with some great kegerator features that include it is Energy Star® compliant, and it uses an environmentally friendly R600a refrigerant. This model comes with automatic defrost and has a CanStor® beverage dispensing system, which is perfect for holding those cans alongside the keg. The thermostat is mechanically making it easy to control. There is an internal light, and the handle is integrated. In terms of functionality, this is a great kegerator friendly unit, it has the added features for a perfect drink dispensing machine and together with the keg will turn any room into a mini professional bar. 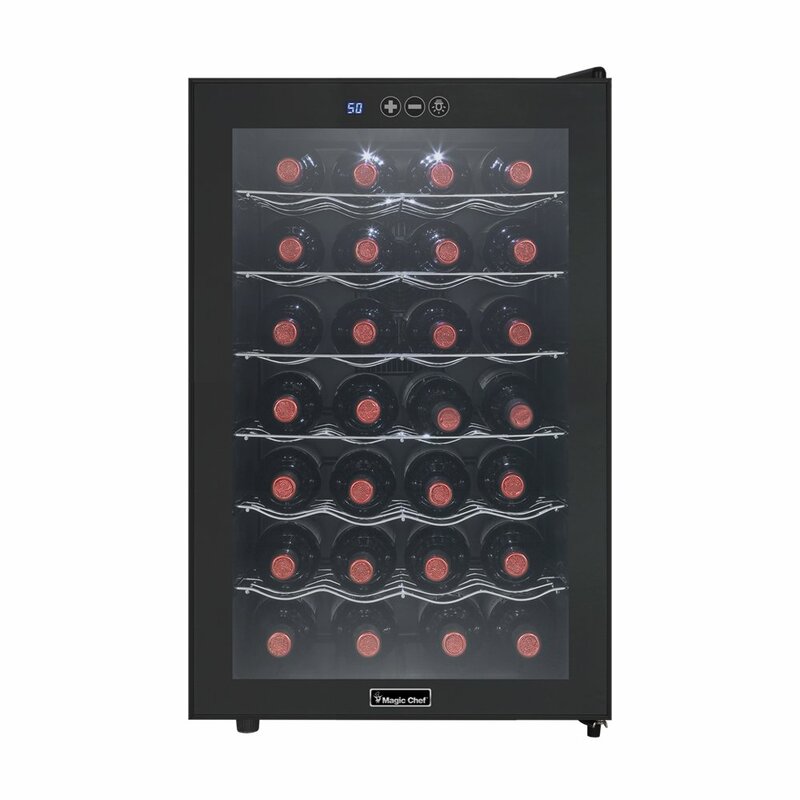 The Magic Chef MCWC28B 28-Bottle Wine Cooler is a glass door wine cooling unit that can be made into a tower kegerator for the fancy transparent style. Why settle for a standard fridge when you can get a wine cooler unit that delivers beer with style. This model will fit any tower kegerator kit seamlessly, and you get loads of fun showing off the keg through the glass door. This model comes with a quiet Thermoelectric Cooling unit and has an exterior Digital Thermostat with Blue LED Display for easy control over the temperature. There is an internal Soft White LED Stage Light, and you will definitely need to remove the racks from the inside to adapt it for your keg. The bottom comes with adjustable legs, so you can also place it on uneven surfaces. This one came as a shock to me too, a wine rack cooler as a kegerated dispenser of cold beer, some would call it blasphemy, I call it genius, so do a few million Belgium beer fanatics. 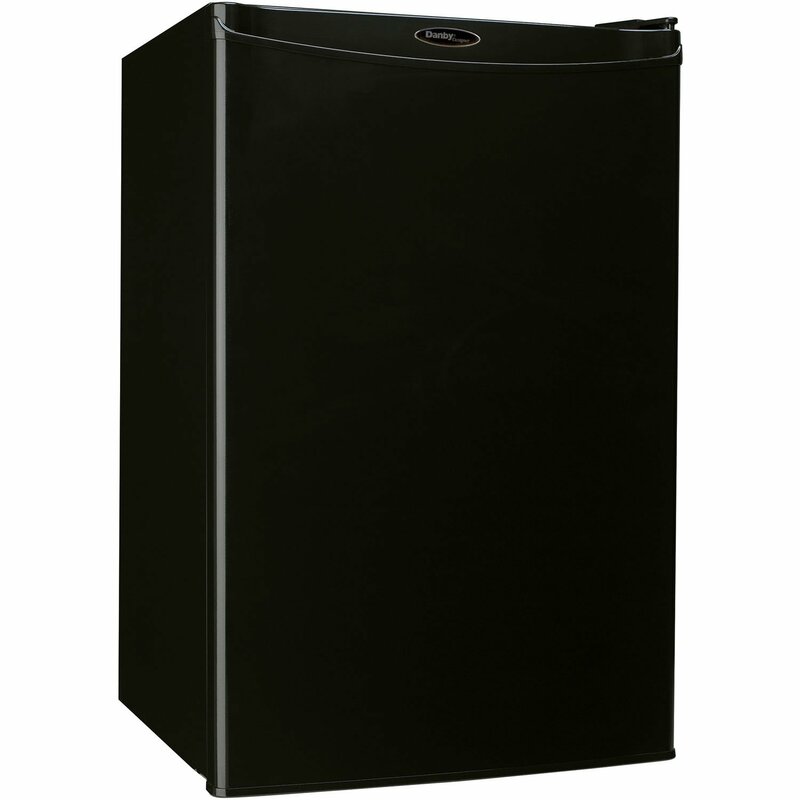 This Energy ENERGY STAR® Qualified compact fridge comes with a compact 4.9 cu.ft. of volume and an overall design that is perfect for kegeration. This fridge unit comes with a316 KWH/Yr Energy Consumption and full temperature control with automatic defrost. There is an integrated handle in the door, and the internals feature an automatic light, a see-through crisper for storing more cans under the keg, and a great little can holding section built into the inside of the door. Overall, a great model to kegerate. This is another great compact unit for small keg applications, and the price complements the level of quality and performance you will get from this fridge unit after conversion.